Get Ready for #AskAnArchivist Day! Got a question for an archivist? 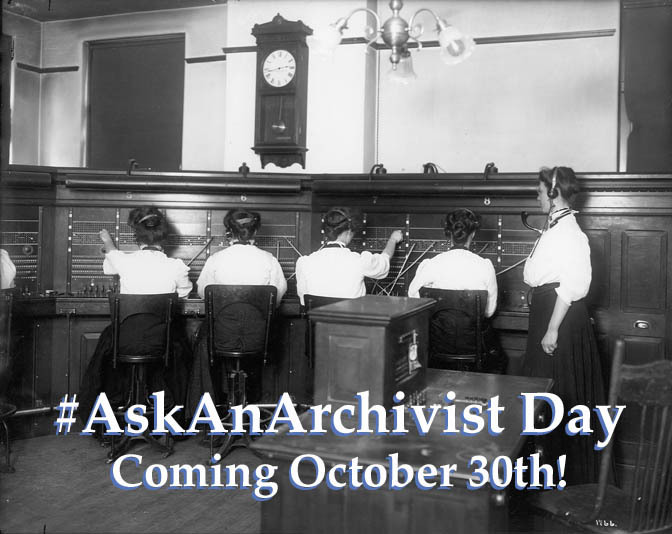 Next Thursday, October 30th is ‪#‎AskAnArchivist‬ Day! Wondering what our day is like? How we landed our awesome jobs? Where to look for a particularly daunting piece of information? What our favorite document is? Ask away next Thursday! Our staff will be monitoring Facebook and Twitter all day. No question is too silly or too practical. What is #AskAnArchivist Day? It is day where archivists around the country take to the net to chat and answer any questions you may have about all things archives. So get your questions ready! 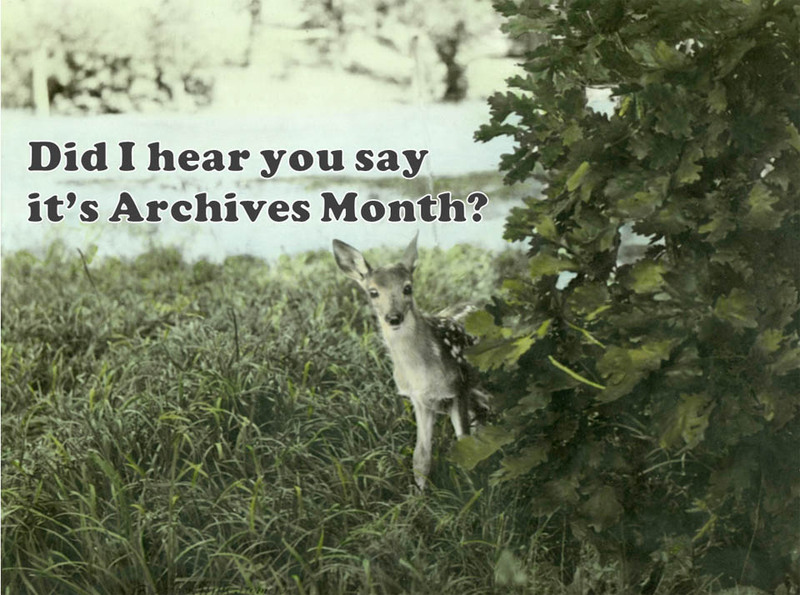 Happy Archives Month! A wise researcher once said “genealogy without documentation is mythology.” During October, we will be taking a closer look at some of the wonderful genealogical resources available at the Archives and how they can help you dig deeper and possibly solve your family history research problems. 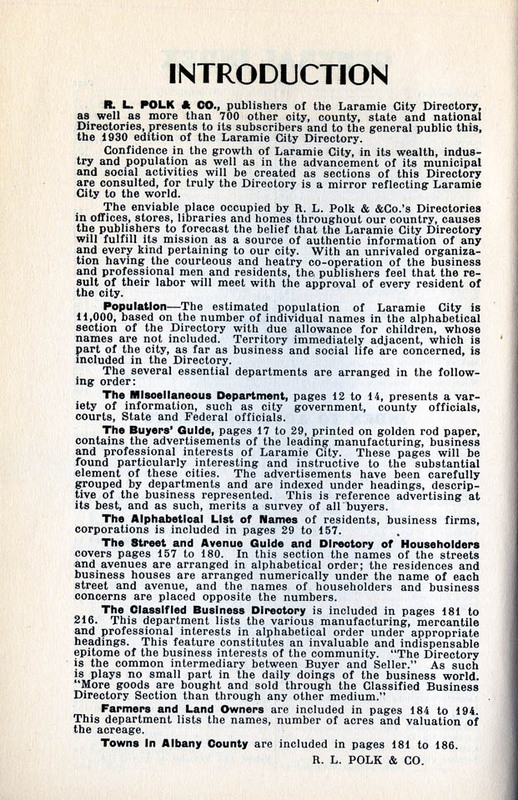 Examples of city directories from around Wyoming. These books can be wonderful resources for genealogists. City directories first came in to use in what is now the United State in some of the east coast cities in the eighteenth century, and continue to be published today in both the US and Canada. 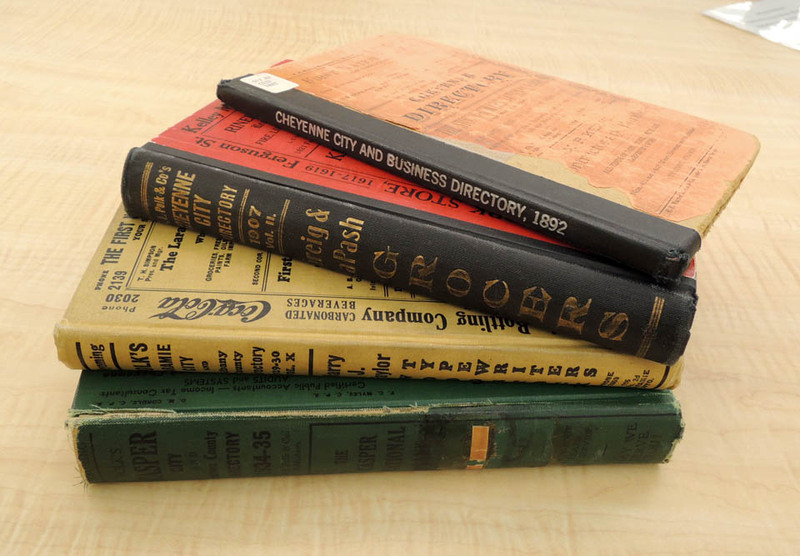 While there were many publishers involved, the most recognized publisher is (R.L) Polk City Directories. 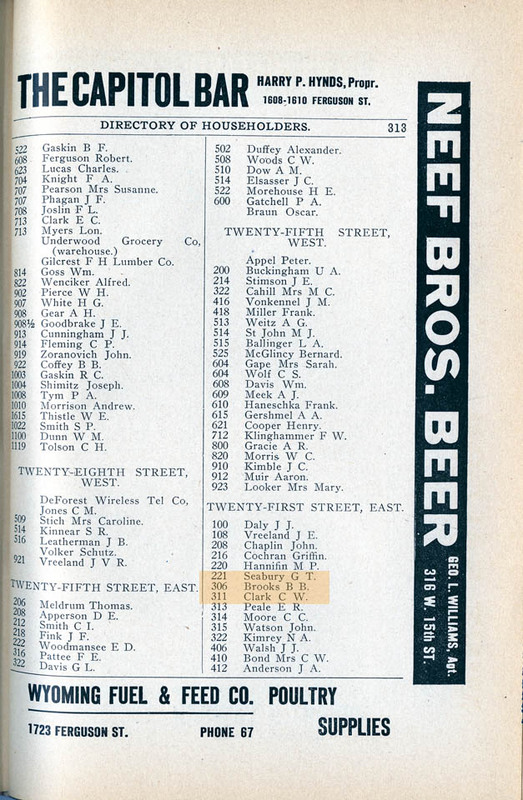 The directories were used to help salespeople and deliverymen locate individuals for commercial and delivery purposes, and to provide advertising space for businesses, much like later telephone books. The directories were often produced annually or every other year. Before starting your research in the city directories, review the table of contents and introductory text to better understand the organization, format and abbreviations in the book. The introduction may provide clues as to the organization of the particular directory. Included in the listing was the name of the head of household, the street address and often the occupation and employer of the head of household. This information can lead to some interesting discoveries, as well as the possibility of verifying family stories of what a great-grandfather did for a living. The listing may also include whether the individual was a boarder, renter, or owner. 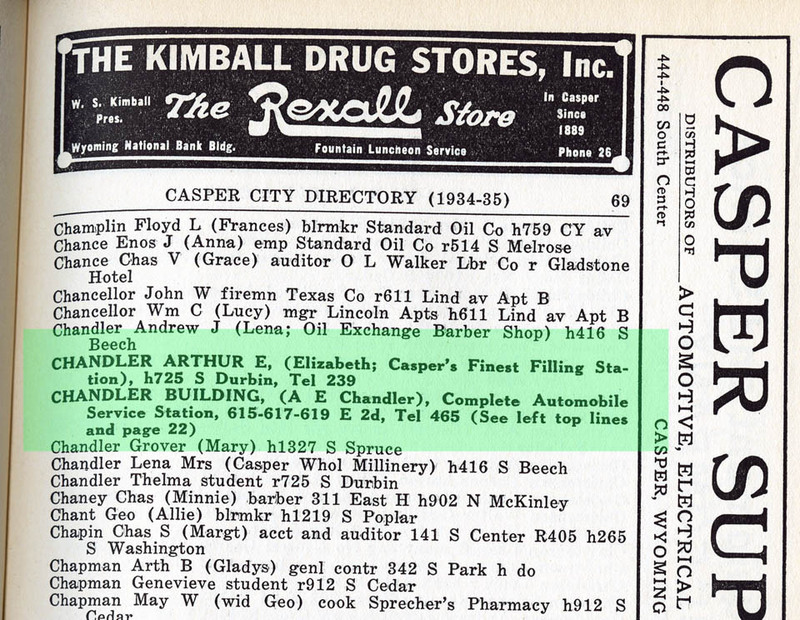 This page of the 1934-35 Casper Polk Directory includes A.E. Chandler. From the entry we find his full name was Arthur E., his wife’s name was Elizabeth. We can also see that Changler ran the Casper’s Finest Filling Station. Business must have been going well because he had a telephone at both his home and the business. 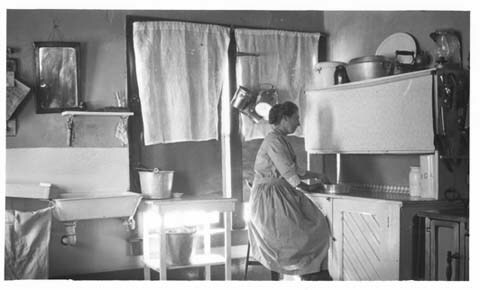 By the mid-twentieth century these directories included a street cross-index, which is useful for determining neighbors, or who lived in the house prior to and following your ancestor. Looking through the street index listing lets the researcher see if there are relatives living in the same neighborhood. This is also helpful, if your ancestor is using a nickname. In past research, using the street address has helped this researcher discover Gaylord Everett, who was going by Gale Everett. 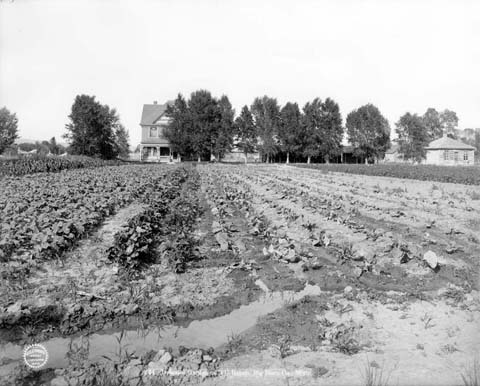 It is much easier to determine the address of a residence using the directories than from the census records. They give the researcher the opportunity to go to the physical address and visualize where their ancestors lived. In the absence of census records, directories are very helpful in tracking the movement of those elusive ancestors more frequently than census enumerations since they were published annually or bi-annually. Many directories include community pages which would list houses of worship, clubs, cemeteries, businesses and possibly a city map. If your ancestor lived in a small town or a big city, chances are they can be found in a city directory. This “directory of householders” includes the area surrounding the Historic Governor’s Mansion in Cheyenne. This portion of the directory can help you identify neighbors or neighboring businesses. It is also quite helpful when researching buildings. Once you have a name, the “white page” style listing can tell you more about the individual. As with any mass produced item, accuracy may be an issue. In some instances, people had to pay to have their names included in a directory and ethnic and racial minorities were often excluded. Also the year on the cover is most often the publication dates, which is not necessarily the year the information was collected. But most of all, don’t be surprised if you find yourself “reading” the directory! They are full of clues, and facts that help place your ancestor in historical context. Death certificates are one of the most popular records used by family historians for their research. Depending upon when your ancestor died, they are one of the first sources a researcher should seek to learn more about their ancestor. Once in your possession, go through each line of the document and seek out additional evidence for the information vital to your research. Like all good sources, the death certificate leads the researcher to other documents. Death certificates provide us much more information than just the date of a person’s death. Information contained on the death certificate may lead you to other records. However, some information should be approached with caution. Death certificates contain primary and secondary information. Remember primary information is recorded at or near the event, by a person who has direct knowledge of the event; whereas secondary information is recorded long after the event, by a person who was not present at the event. 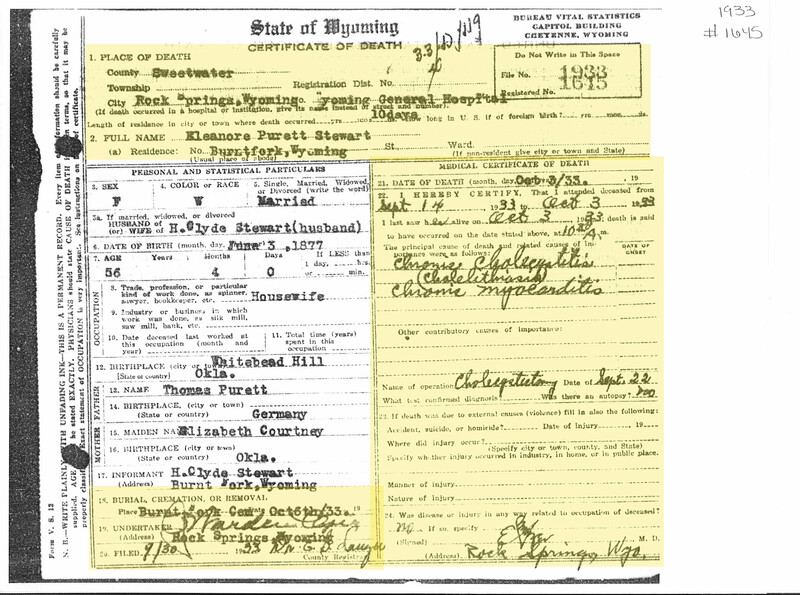 The yellow shaded portions of this death certificate show the information that can be considered a primary source and thus is most likely trustworthy. This information was provided by doctors, coroners, undertakers, etc. who attended the deceased at the time of their death or just prior to this certificate being completed. This certificate was issued for the death of Elinore Pruitt Stewart, author of the book Letters of a Woman Homesteader. But notice that there is a discrepancy between the first and maiden/middle names she published under. Further research may be necessary to decide whether or not to trust this source for that particular bit of information. The primary information is the information regarding the event itself: the person, place, date, time, the cause, and other information pertaining to the event that just took place. 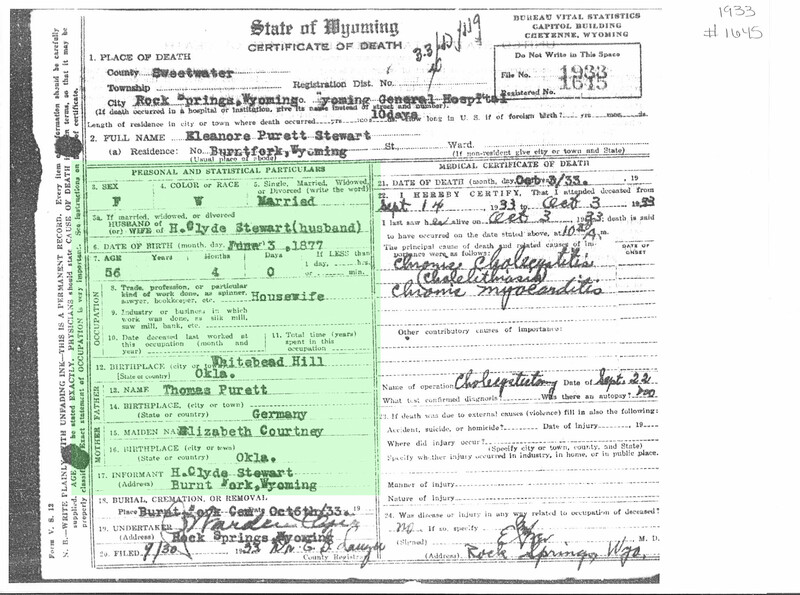 The green shaded portion of this death certificate is the secondary source information provided by the informant. This information may or may not be trustworthy, depending upon who the informant was. In most cases, the informant was not present at the time of the deceased’s birth and thus the information could be considered hearsay. But it is a great place to find clues for corroborating documentation. The secondary information is the biographical information – the birth date and place, parents’ names and birthplace. The accuracy of this information is directly dependent upon the informant, and their relationship to the deceased. Usual residence information is particularly important when a person dies in another state. Example: A person with a usual residence of San Antonio Texas dies in Tucson Arizona. If a cemetery name is given, it could be located in San Antonio or Tucson. Also, the usual residence information should lead you to the city directories, census records, newspapers for obituaries, and the cemetery depending upon its location. Over time, death certificates have come to include military service, and social security numbers, which are records available for research, also, an unusual cause of death (homicide) may lead you to the court records surrounding the event. 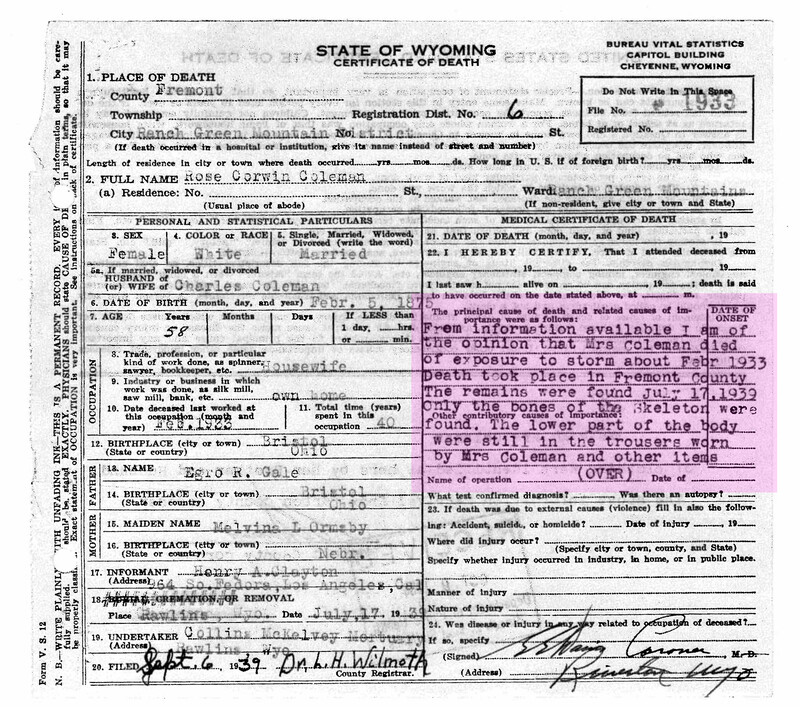 The pink section highlights the coroner’s notes about the death of Rose Coleman, also known by her rodeo stage name “Prairie Rose” Henderson. Rose disappeared in a snowstorm in February 1933. More than 6 years later, remains were found that were thought to be hers. A death certificate like this one may lead you to other sources like coroner’s inquests (for suspicious/unattended deaths), probate records, newspaper articles, etc. You may also want to check for documentation filed with a death certificate like this one. If you notice, the highlighted area says “over”, meaning there is likely more information on the back. In this case, there was also a letter from the Vital Statistics staff documenting why two certificates were issued and other administrative notes. Don’t forget the obvious clue: someone has died, did they have a will? Is there a probate file with the court? Both of these documents can provide further clues to research. 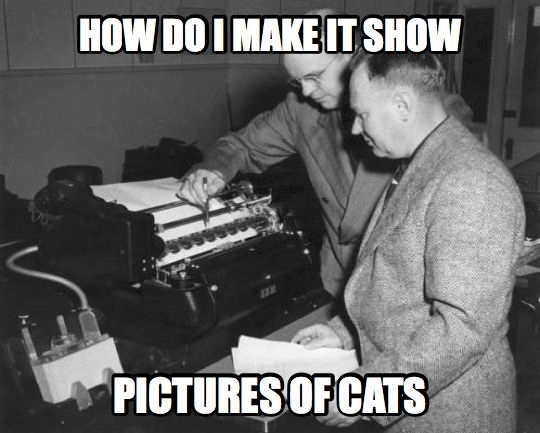 Do you often look at old photos and think of humorous captions? We do too! Break out your best one-liners and ironic humor because its contest time! Thanks to the Utah State University’s Merrill-Cazier Library for this great example! Are you ready to try your hand? This week’s image is…. – Please do not personally attack the people in the historic images. They are someone’s relatives! Leave your best in the comment sections or on Facebook. We will share the best here on the blog on Friday. Happy Archives Month! 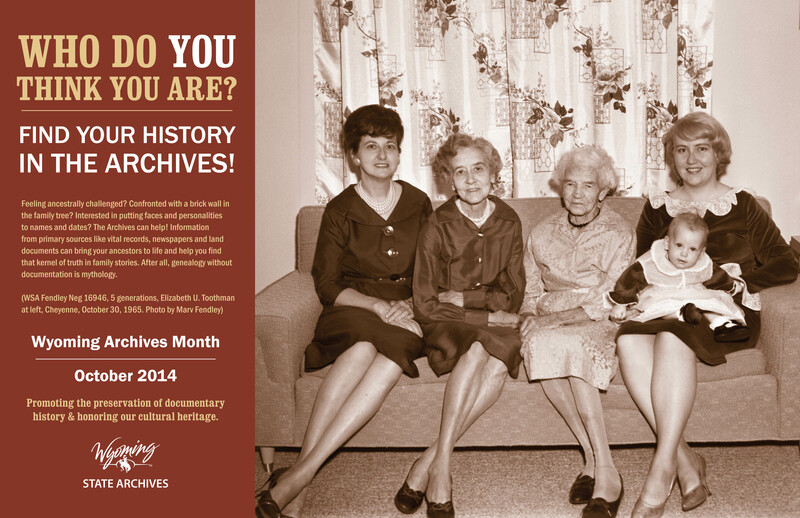 Did you know that October is also Family History Month? 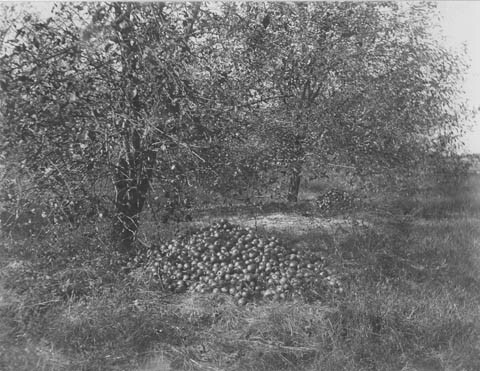 What better way to celebrate October than by digging into your family history at the Archives! Check back throughout the month for caption contests and posts highlighting record types that help you dig deeper into your family history. It’s not a Hallmark holiday yet, but Electronic Records Day is gaining momentum and importance with each passing year. 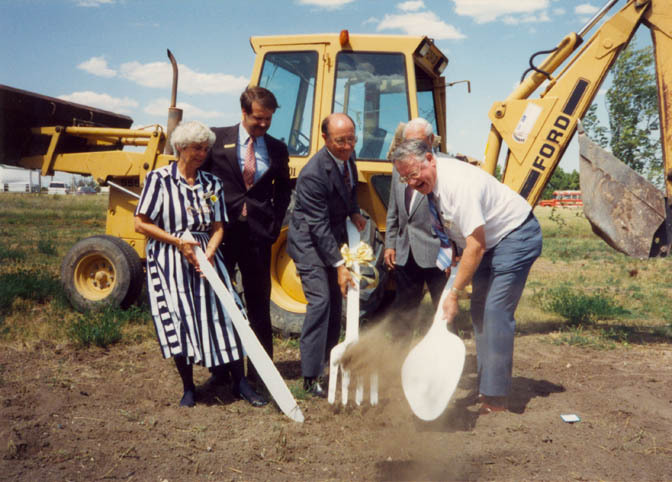 E-Records Day is an opportunity for archivists to raise awareness about the crucial role electronic records play in our lives and the special effort required to preserve them long-term. The preservation of electronic records is an issue that affects us all. Many important records that we used to keep in paper form – for instance, photos, tax documents, and correspondence – are now often electronic. These records are more at risk than paper records and therefore require more attention. Our friends at the Council of State Archivists have put together this list of tips for preserving your digital records. Go celebrate the day by copying, organizing, and migrating your electronic records!